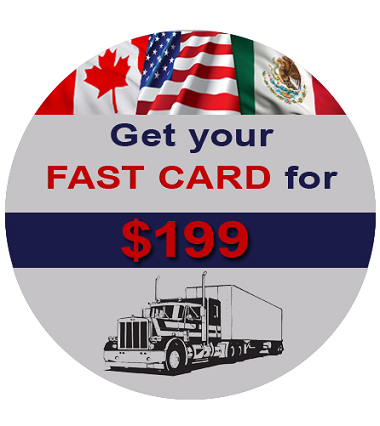 The FAST card (Free and Secure Trade) is an identification card which allows truck drivers to cross the US-Canada or US-Mexico border in their commercial vehicle more quickly and with less hassle. This is because all FAST card holders are first pre-screened with thorough background checks, and are then interviewed to make sure they are low-risk. Over 78,000 drivers are FAST card holders. The US-Canada and US-Mexico FAST card programs are separate from each other. You cannot use your US-Canada FAST card at the US-Mexico border, or use your US-Mexico FAST card at the US-Canada border. You can apply for both cards at the same time, but you have to file two separate applications and attend two separate interviews. Who can get a FAST card? I was rejected for a FAST card. What now? Be admissible to the United States and Canada (must not have any criminal convictions or immigration violations). For naturalized citizens of the US or Canada, it is recommended that you have been a citizen for at least 3 years. Please click here for reasons your FAST card application may be refused. Be admissible to the United States (must not have any criminal convictions or immigration violations). The US-Canada and US-Mexico FAST programs have almost identical requirements, except that citizens and permanent residents of Mexico are NOT eligible for the US-Canada FAST program. To apply for a FAST card, you have to have documents showing proof of your citizenship, proof that you can legally live in the United States or Canada, and proof of your address. As a FAST card holder, when you arrive at the US-Canada or US-Mexico border, you scan the barcode on your FAST card at the dedicated terminal. If there is no automated barcode scanner, you present your fast card to the border officer along with your passport, bill of lading, inbound cargo manifest, and customs declaration form. The officer will scan the barcodes on the documents and the verifications of the information on the documents will be done at a later time, after you have already left the border. This more efficient processing of low-risk loads allows shorter wait times for drivers. First, you fill out the application as much as you can. You can do this online, or by printing the application and completing it by hand and sending it to us by fax, email, mail, or dropping it off in person. Next, we review your application and fix any mistakes that could cause your application to be rejected or delayed. We will also let you know if it looks like you may not be eligible to apply, or if there is something that could cause you to be refused. Then, we submit your FAST card application to the government for you. When the government receives your application, they will do background checks on you in both the United States and Canada or Mexico depending on which program you are enrolling in. Primarily they are checking for criminal history and immigration violations. You must pass the background checks in both countries to be issued a FAST card. This process takes about 8 weeks for most applicants, and we will monitor the progress of your application during this time. After the background checks are completed, you are either "conditionally approved" or rejected for a FAST card. If you are conditionally approved, we will contact you for your preferred time and location and then schedule the interview on your behalf with the government. At the end of your interview, you will be told whether you have been approved for your FAST card or not. If you are approved, you will receive your FAST card by mail in around 7 business days. If you are rejected, sometimes you will be given a reason such as criminal convictions, but sometimes you will just be told that you don't meet the requirements. Please click here for more information if you were rejected for a FAST card. If you don't meet the background check standards for both the United States and Canada or Mexico, your application for a FAST card will not be approved. Your application can be refused at the time of your interview, or before at the pre-approval stage. Please see the list below of common reasons that an application may not be approved. If you are an American citizen and a criminal history is holding you back from getting a FAST card, applying for Criminal Rehabilitation through the Canadian government may help you meet Canada's background check requirements for the FAST card. Or, if you are a Canadian citizen with a criminal history, applying for a US Waiver may help you pass the FAST card background checks. But, please note that if you have criminal convictions in your background, it will be the personal decision of the officer reviewing your application whether or not you will be approved. Being approved for Criminal Rehabilitation in Canada or a Waiver in the US does not guarantee that you will be approved for a FAST card. In most cases, applicants with criminal history are refused. If your application for a FAST card has been denied, there are steps you can take to appeal this decision. But, there are seperate appeal processes depending on whether you are an American or a Canadian citizen. If you need help appealing a FAST card application refusal, contact us. If your application was refused, the first step is to schedule an appointment to speak with a supervisor and explain why you think you should have been approved. If the supervisor does not reverse the decision and approve your FAST card application, you can email or write to the Customs and Border Patrol Ombudsman and explain why it should be approved. You should cite evidence of why you think you should have been approved when speaking with the supervisor or the Ombudsman. If your FAST card application was refused, the first thing you can do is send a letter to the Processing Centre where your application was processed. Your letter must be sent within 30 days of the time your application was rejected or your FAST card was suspended. You will get the result of the appeal in writing. Finally, you have the option to take your case to Federal Court. If your job involves transporting materials classed as "hazardous", you may need a Hazardous Materials Endorsement (HME) on your commercial Driver's License, which will show that you have passed the required security checks. If your FAST Card has a mistake on it you need to replace it immediately as the discrepancy between your FAST Card and other IDs or documents you are carrying with you could lead to problems with customs. If your FAST Card is lost, stolen, or damaged you should contact the Enrollment Centre where you got your card immediately. You will have to pay a fee of $25 to replace the card. If your card was damaged but you still have it, you will have to return your old card. If you are a Border Cards client, we will replace your Card at no charge provided you lost it within 6 months of receiving it. You will still have to pay the government fee of $25. If your FAST application was rejected you can appeal the decision within 30 days. You should make sure your employer is properly vetted as part of the FAST program: as a Customs Self-Assessed-approved partner in Canada, with a signed Partners in Protection memorandum of understanding; and a member of CTPAT in the US.